This feature appears in the November 2016 issue of All About Beer Magazine. Click here to subscribe to the magazine today. We’ve long believed that enjoying beer goes beyond just the liquid. 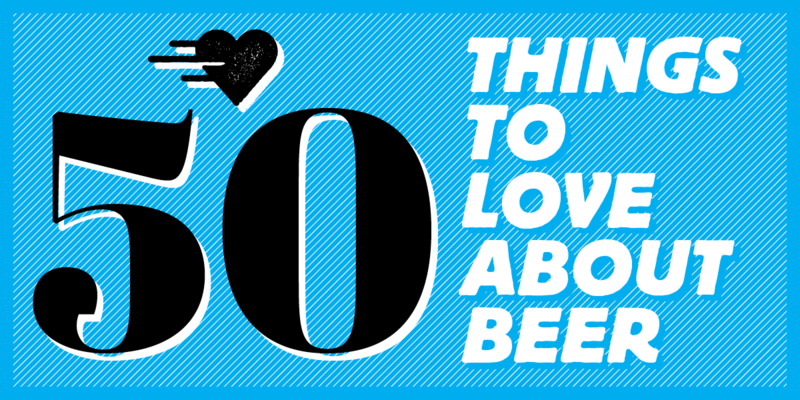 In putting together this issue, we talked about the things we like about being beer drinkers. From the everyday items that are easy to take for granted to the more obscure customs and barroom etiquette, we gathered together thoughts from brewers, writers and readers to come up with the following list. And because we appreciate lively conversation, we want to know what you think. Share your thoughts on what you think deserves its place on this list by reaching out to All About Beer Magazine via Facebook, Twitter and Instagram. There’s a bar outside of Albany, the Man of Kent. The last time I was there, they had one television, a fairly small one, that I was told was just for major news and sports events. It’s up in the corner of the room. And behind sits the ashes of a former regular — I think his name was Horst? — who hated the television, but loved the Man of Kent, and asked to be “buried” there. They put him in the one place in the room where he wouldn’t have to look at the screen. I like that. I think the old idea of a “bar” is already well-known: a place where you watch the game as you work on quietly getting drunk, stewing in your thoughts. While Bourdain may have a point, I would posit many craft beer bars are not these types of “bars.” You don’t go to see how many shots you can handle before browning out as you watch sports, you go to drink exquisite beer and connect with your friends around you. I do appreciate that the craft beer bars and brewpubs are locally owned and so far I haven’t seen a lot of turnover in staff here in Dayton, O. It kind of makes your day to walk in and they know your name. Also as a local tour guide the owners are always willing to throw a t-shirt or two my way to give to one of my guests. It’s a fickle thing that you can’t cater to all types. It really reflects on the establishment whether TV’s and disturbances are allowed. Several taprooms in Tulsa offer TV’s mainly for sports but American Solera is very minimalist with a community table and picnic benches outside in essence to bring community together. But knowing the brewers, it’s just their personality and experience they want to give their customers.